Planning to grow herbs indoors? Growing sustained, harvestable amounts of herbs indoors require long periods of intense light (6-8 hours of direct light for most varieties). Why? Abundant light is essential for helping herbs produce the oils that give them their distinctive flavors. The Foody Smart 2 includes it's own LED light. Without the right amount of light, your herbs won't taste much like ... well ... herbs. Sunlight is ideal for herbal plant growth, but when growing indoors it's not always possible to get enough, especially during the winter months. Here we'll explore some options for giving your herbs all the light they need. But first, a word of caution: not all herbs grow well indoors. Cilantro and dill, for example, don't grow back after a clipping, so you constantly need to replant (not the best choice for a little window garden). Conversely, oregano, chives, mint, rosemary, and thyme grow back when they're trimmed, providing a steady stream of fresh herbs even in small planters. Why is Sunlight so Good? A quick bit of background: The visible spectrum of natural sunlight is composed of color bands – red, orange, yellow, green, blue and indigo. But it's two invisible bands at either end of the light spectrum -- infrared and ultraviolet -- that make sunlight ideal for herbal plant growth. Infrared light (also called infrared radiation) provides heat. An appropriate amount of infrared radiation is an important part of healthy, natural plant growth. The heat provided by infrared radiation is an important signal for plant growth, and herbs grown with infrared light have more robust stems. Ultraviolet light (UV), on the other end, is much maligned and misunderstood when it comes to plant growth. What's important to know here is that the UV light stimulates the natural defense mechanisms in herbs, including the production of essential oils (flavor) and other substances that are good for our bodies (i.e. anti-oxidants, anti-inflammatory, etc.). Without the UV, herbs lose those properties that make them beneficial. The big problem with natural sunlight? It's not always possible to get enough through your window, or during the low-light days of winter. The artificial lights in your home don't emit a balanced spectrum of light, but instead give off light that is in excess of one or more of the color rays. For example, your typical household incandescent bulb gives off light that is heavy on the yellow, orange and red rays, while standard fluorescent bulbs produce a more yellow/green light. So what kind of light should you get for your herbs? It seems like there are a million options for picking grow lights (because there are...). I'll try to make this as simple and helpful as possible. First off, don't use a sunlamp. Sunlamps are for people, not plants. They often produce either too much of either infrared or ultraviolet rays, which can be harmful for the plants. Second, energy efficiency matters. These lights will be on for up to 12 hours a day, so more efficient will save you money in the long run. These are both the least efficient grow lights and the least expensive. You can get an incandescent grow light kit for around $20. These lights won't last long, though, and they don't provide the full sunlight spectrum. They'll help your herbs grow, but not to their full potential. Fluorescent grow lights are a good option that won't break the bank. A nice hanging setup can be had for in the $30 range. However, your herbs won't get the benefits of a "full spectrum" of light unless you opt for the more expensive T5 system. Fluorescent lights also have to be replaced often (about once a year) and they only really come in one size variation (long), meaning they aren't the most convenient light source to set up in your house. LED grow lights are extremely energy efficient, and they offer an ideal light spectrum range for herbs. They are also by far the most expensive. We recommend starting with a simple hanging setup, which will provide light for most small indoor gardens for around $150. What's better than an LED? A full spectrum plasma light. These are unholy expensive, but they are the next closest thing to the sun in terms of full spectrum and UV/infrared light, and they are even more efficient than LEDs. And they are definitely overkill for my simple indoor herb gardens, but I want one anyway. ﻿﻿If you don't want to hassle with setting up special grow lights, but you still want to grow indoors, there are new all-in-one herbal grow systems coming on the market (like the Foody Smart 2 and the EcoPro) that combine lights with a planter. When possible place your grow lights directly above your herbs. In this way you mimic natural sunlight coming from overhead (many grow light systems come with kits for hanging the light at a desired height). You want your herbs to grow up and evenly. Fluorescent bulbs supplement natural light in a windowsill. Incandescent lights: should be at least 24 inches over your plants. (these put off alot of heat, and you don't want to fry your plants). 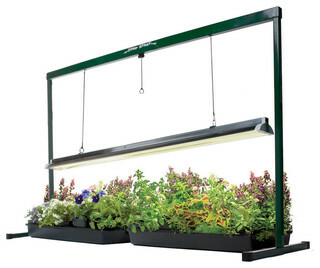 LEDs have a lower heat signature, so they can be placed 6 inches over your herbs. Keep adjusting the placement of the grow light as your plants develop and mature to maintain the proper distance.